These photos were taken by G. Fred Lukens as Marilyn arrived in Atlantic City for the Monkey Business premiere and Miss America pageant in September 1952. There’s also a handwritten note in black pen that reads “Micky – a wonderful dancer, who taught me how to do ‘Tiffany’ the way it should be done. Love & kisses Marilyn Monroe Korea Feb. 54.” The note is written on a US Army “2D Inf Division” invitational card with Monroe at lunch on February 18, 1954. This photo, taken with Billy Wilder on the set of The Seven Year Itch, proves beyond doubt that directing Marilyn was worth all the pain. This Marilyn-owned black lace padded bustier (Size 36B) was featured on Julien’s Facebook page yesterday. This ivory silk gown, designed by Castillo for Jeanne Lanvin, is estimated to sell for $20,000-$40,000. Assorted documents include this life insurance receipt, from April 1957; a batch of press-related correspondence, revealing Marilyn’s conflicts with Time magazine, and columnist Hedda Hopper; and telephone messages left at the Beverly Hills Hotel in May-June 1961, from dress manufacturer Henry Rosenfeld, DiMaggio pal Chic Masi, hairdresser Sydney Guilaroff and the lawyer and agent, George Chasin. As reported recently (see here), a Marilyn-owned black wool dress is being sold to preserve an import archive of Abraham Lincoln memorabilia. Photos taken by Arnold Newman of Marilyn with Lincoln’s biographer, Carl Sandburg, in January 1962 are also on offer, plus this bust of Sandburg also owned by Marilyn. This Gene Daniels photo shows Marilyn with Jose Bolanos at the Golden Globe Awards in 1962. 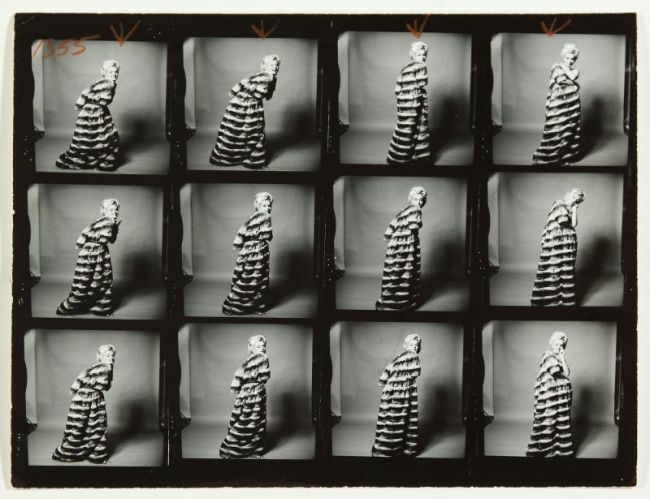 A contact sheet from the Bert Stern/Vogue sitting in June 1962, with Marilyn draped in a chinchilla coat is up for sale. 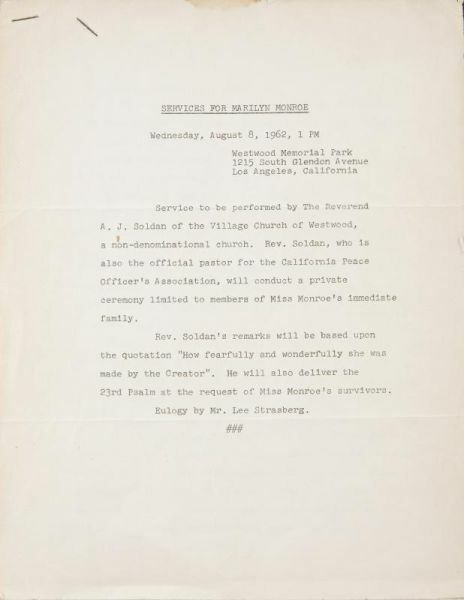 And finally, this five-page program for Marilyn’s funeral in August 1962 (Joe DiMaggio’s copy) features a guest list plus the full text of Lee Strasberg’s eulogy. UPDATE: The black wool dress sold by the Lincoln foundation sold for $50,000; a signed photo for $44,800; the Lanvin gown for $3,500; the bustier for $28,800; and Marilyn’s Jewish prayer book for $16,000. 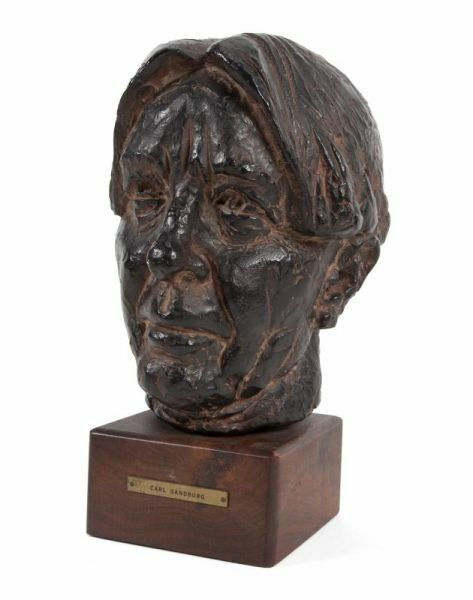 Her bust of Carl Sandburg went unsold, however. You can read the results in fill here.